Fracking is common the area, which has been known to cause earthquakes. 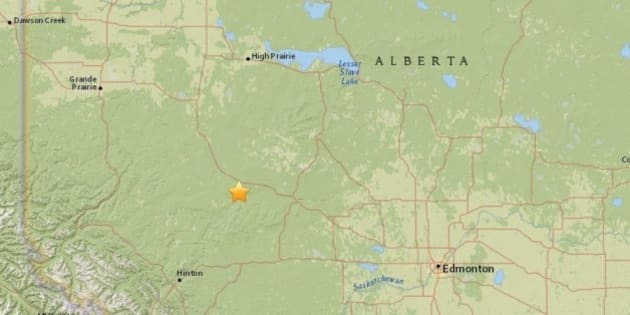 An earthquake has struck northern Alberta where past tremors have been blamed on hydraulic fracturing from the oil and gas industry. National Resources Canada detected a 4.4-magnitude tremor on Saturday evening, 36 kilometres east of Fox Creek. The U.S. Geological Survey reported it was a magnitude 4.0. Fox Creek, an oil and gas town of 2,000 people, is more than 200 kilometres northwest of Edmonton. Hydraulic fracturing, commonly known as fracking, was found to be the likely cause of a January 4.4-magnitude earthquake in the same area. The tremor caused some minor damage, reported CBC News. Fracking is a drilling process where a high-pressure mix of water and chemicals is injected into the earth to break through rock and release the gas inside. It's a controversial process because of the massive amounts of water that must be transported to each site. Critics also worry about the chemicals involved, as well as the potential to cause tremors. After the January earthquake near Fox Creek, the Alberta Energy Regulator set up new rules to monitor seismic events. Since then, a company fracking in the Fox Creek area reported two earthquakes with magnitudes of 2.2 and 2.1 on May 28, according to The Tyee. A third measuring 2.4 was also detected on April 16 in the same region. Gail Atkinson, who researches induced seismic hazards at Western University in Ontario, found that a "swarm" of 25 earthquakes with magnitudes of 2.5 to 3.5 between 2013 and 2014 in the Crooked Lake region near Fox Creek corresponded "closely to hydraulic fracture treatments of oil and gas production wells in the immediate vicinity." Fracking is an increasing concern in the U.S. In Oklahoma for example, earthquakes are occurring at a rate that's 600 times the historical average. In 2014, the U.S. state experienced 585 earthquakes of 3.0-magnitude or higher, compared to an average of 1.6 quakes annually between 1978 and 2008. They are "very likely triggered" by wastewater injection that's part of the fracking process, said a report released by the state this spring.